LGBT refugees from around the Middle East who have fled to Turkey are less likely to make it to Canada because of the government's focus on resettling Syrian refugees, says Arsham Parsi, executive director of the Iranian Railroad for Queer Refugees. He estimated that there are 1,200 LGBT people from places like Iran, Syria, Iraq, Afghanistan and Somalia who have left their home countries for Turkey and are now waiting to be granted refugee status. 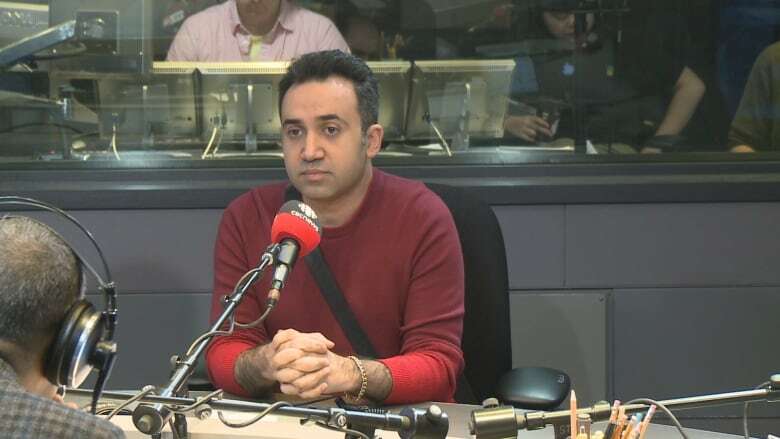 Parsi told CBC Radio's Metro Morning that these refugees live in fear of being exposed after fleeing countries where they faced discrimination, torture and death if they were found out. Matt Galloway: What is life like for these refugees in Turkey? Arsham Parsi: Turkey is not a safe country for homosexuals. So they become more conservative, and there is a lot of religious homophobia. Even Turkish LGBTs are not safe in their own country, so for someone who is foreign, who is a refugee, who doesn't have support or an understanding of the Turkish language, there are a lot of challenges. The worst thing is they are being discriminated against or assaulted by other refugee groups, as well. MG: You say the Canadian government has put [LGBT] refugee claims on the back burner. What are you accusing the government of? AP: It's not an accusation, it's a request... When the new government came on we were hopeful that they would expand and support more refugees. The government pledged to bring 35,000 Syrians and they put other non-Syrian refugees on hold. I am very proud to help Syrian refugees. But I believe helping a group of people does not mean to put other vulnerable people's life on hold. MG: Is that what you think has happened? AP: Yes, especially in Turkey. Because [Immigration, Refugees and Citizenship Canada] says they don't discriminate, that they accept all refugees that are being referred by the UNHCR [The United Nations Refugee Agency.] But embassies are in charge of making decisions. And several times in the last two years the Canadian Embassy in Ankara told the UNHCR not to submit any non-Syrian applications. MG: How has the situation in the United States — the travel ban and hold on refugees — how has that complicated the lives of the people that you deal with? AP: It makes things worse. When the Canadian immigration pipeline was full, the UNHCR encouraged refugees to go to the United States. A lot of people make the comment that it's only 120 days of waiting, but for someone who doesn't have money, who doesn't have support, it's 120 lunches, 120 dinners, 120 days of rent. It's a lot. MG: We received a statement from Immigration, Refugees and Citizenship Canada and it says in part that there was a focus on resettling vulnerable Syrian refugees but that Canada has never stopped processing resettlement applications from other refugee populations. AP: They passed the buck for several years. There is no way the UNHCR wants to keep refugees in Turkey. My last meeting with the UNHCR in Ankara was in November and they said 'We don't want to keep them here, our goal is to send them to a safe country as soon as possible, and all the time Canadian commission asks us to not submit non-Syrians...'. It's a paradox. Immigration says we accept anyone, but the Canadian Embassy is in charge of making decisions, which I believe they shouldn't be. MG: For these [LGBT] refugees, was the situation better under the Conservative government? AP: The honourable Jason Kenney was a really good minister of immigration and it was a golden era for LGBT refugees. He increased the refugee-per-year quota to 1,100, and it's still 1,100. MG: What do you want from the current government? AP: I'm saying, help these vulnerable people. And if they want to take all of the LGBT refugees in Turkey it's just 1,200 people, we're not talking about 30,000 or 35,000 people.